- You’ll find this dungeon on the east side of Happy Happy Village, and Ness should be more than strong enough to brave the thing if you’ve defeated Carpainter. That said, Paula is very weak at pitiful little level one, and you should get her a few levels before you go too far into the cave. Make sure you pick up some equipment for her at the Drug Store, as well. She’ll learn some potent offensive PSI moves that will turn her into an excellent ally. Mole Playing Roughs are strictly-physical enemies who will occasionally waste their turns. Shrug. Weak on their own, Mr. Batties are a bit tough in packs, which is how they often attack. Paula’s Fire A attack is quite good at taking them out. Mighty Bears are as tough as they look, and hit quite hard. 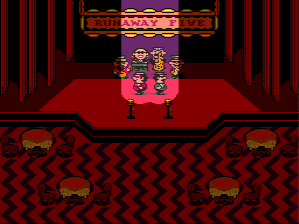 They’re good candidates for Paula’s PSI Freeze A attacks. - Take a right from the entrance and walk east until you reach a split in the path. head south and west to find a small body of water. On the opposite side of the water is a present containing a Great Charm. - Head back to the intersection and continue east a short way to another split. Keep going east to find a Croissant, then head back to the intersection. It loops south, east, and back north. 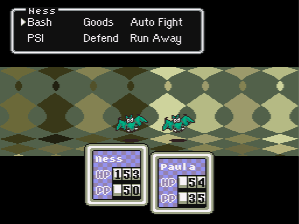 This can be a rather difficult fight if Paula isn’t levelled to ten or above. The Mondo Mole is a rather straightforward bloke, and either uses normal physical attacks - painful enough - or a tearing attack that can easily wipe away more than half of Ness’s health at an average level. This can eliminate Paula in no time. 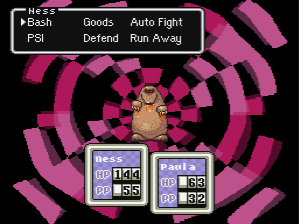 Go at it with Ness’s physical attacks and, assuming you have plenty of PP left over from the trip, Paula’s PSI attacks. PSI Freeze is pretty useless in the damage department, but it can temporarily freeze the Mondo Mole; PSI Fire does meh damage; PSI Thunder can do a lot of damage, but has a questionable accuracy. I recommend PSI Thunder, personally. 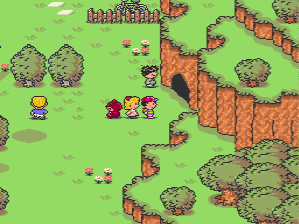 Have Ness ready to use Lifeup if Mondo Mole lands a mortal blow, or Paula with a healing item to at least keep you from dipping below zero. Mondo Mole will occasionally put up a psychic shield to block your PSI attacks, but one good psychic attack will dispel it. - Beating the Mondo Mole will open the way to Lilliput Steps. Step inside, record the melody, and heal. You’ll find the enemies in the cave unwilling to fight any longer, which should come in handy for levelling Paula. - Head back west from Happy Happy Village. You’ll find the bridges of Peaceful Rest Valley repaired, allowing you to progress much more easily. Once you’re back in town, return Paula to the Polestar Preschool and speak to her mother to receive a Hand-Aid. Head to the back rooms for a tearful goodbye from her dad. - A dude from Everdred will be waiting outside. Speak to the crime boss in Burglin Park - note that Paula must be conscious - and he’ll give you a Wad of Bills. - Head north to the Chaos Theatre and speak to the dapper gents beside the bus to the right of the theatre. The one in black, Lucky, will give you a Backstage Pass. You can use this to get into the theatre and see the show of the Runaway Five. Speak to a girl in blonde on the dance floor and she’ll help you get into the back room, where the Five are getting ready. Speak to them to learn of their money woes. - Leave the dance floor and speak to the manager in the office on the left. Show him the Wad of Bills - you’ll have to be standing beside him, behind the desk - and you’ll free the Runaway Five from their debt. - The tour bus is waiting outside, as well as a photograph moment. Speak to Gorgeous (arguably his name) outside the bus and he’ll offer to ship you out of Twoson and off to Threed. Be careful agreeing to this, as you will not be able to leave Threed until you complete its major quest - and Threed is a rather dangerous place.